I discovered bullet journal early 2015. I saw the video in my Facebook Newsfeed, fell in love with the idea and researched more about it. I love lists and I can't go on with my day without any concrete plan on what I have to do. Bullet Journal is an analog note taking system created by Ryder Caroll. It's a genius way of making lists and reminders and notes and planning routines in one place. All you need is a notebook and a pen and you're good to do. I have to be honest though that starting and committing to a bullet journal system isn't an easy task. I have days when I skip planning and start my day to get things done. I will also hate myself for not being able to commit to my habits and routines blaming everyone around me. But all those months spent finding the perfect bullet journal setup led me to finding my current setup. And I love it. 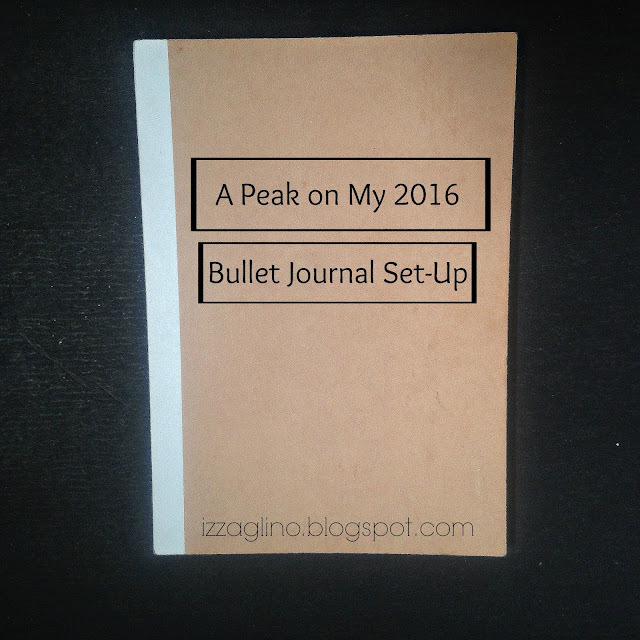 So today I will be guiding you in a peak inside my bullet journal setup 2016. Over my year-end review I realized that one bullet journal isn't enough for me. My to do lists always end up becoming a wish list. So this year I am keeping three notebooks. Since I am fond of making lists, the Master Notebook works for me in so many ways. It's where I keep all of my collections. The idea of Collections in a Bullet Journal is simply a list of things on a particular subject. This could be your Places to Visit, Recipes to Try, Habits and Routines and so on and so forth. I also keep my Master To Do List in this notebook. I dump everything that I have to do whether it be today, tomorrow or in the future. I write down every thing I have to accomplish in all areas of my life whether it be personal, blog and business, travel, finances etc. Now when I have set a month, a week or a day for me to do it I transfer the task on the Planner Notebook. This way I avoid making tons of to do list but not accomplishing anything. I have a focused mind in getting things done. So What's My Bullet Journal Setup This 2016 Looks? I am using the Muji A5 Dot Notebook. I love this notebook because of its simplicity and quality. For pens I am using Pilot G-Tech in 0.4. I have colors black, green, red, blue and purple which also denotes my color coding system. I also both a set of gel liners to add decor and color on my posts plus a set of pen liners for headers. The Index serves as the table of contents for your Bullet Journal. It makes it easier for you to move from page to page. I've shared over my SavingsPinay Intentional Living December Series that I decided to have a theme this 2016. I put it on the front page on my Bullet Journal as reminder. I decided to create a bucket list meant for 2016 alone. I don't know how many I could cross out but I think this is a nice idea. Most of what I've written are attainable though some will require some amount to achieve. I always have this list on my notebooks. I can't wait to achieve all of my To Read Books and also with God's provision buy new books to add on my collection. I kept a record of reminders this year for me to really achieve my financial goals. It includes setting up a monthly, weekly and daily budget etc. I also had the Things I Want This 2016 which were much pricier than the usual but will give me utmost temporary happiness. I saw this layout on Kara of Boho Berry and I love it. I shared that this year I will be doing the 52-Week Money Challenge so I have that planned out. I also have a travel fund goal because I wanted to go out of the country this year. And then the end of the year goal because we'll be celebrating the 60th Birthday of my Papa and I wanted to contribute on the expenses. This is a list of my goals in terms of personal development, work, physical fitness and finances. If you want a closer look I shared it on SavingsPinay. Finally I was able to create my blogging goals. For so many years that I created IzzaGlino and SavingsPinay I don't set any objectives or whatsoever. But towards the end of 2015 I wanted to transition the blog a little bit. I wanted it to also mature and grow. So I made it a point to write down my goals for my blogs and my YouTube Channel before 2016 ends. This is another blog related entry but here I wrote down my vision for IzzaGlino and SavingsPinay, the topics that I want to tackle this year as well as my schedule. It's nice to have the Mater Notebook as a home for everything. I also did a Weekly Writing Plan which I hope to follow so I'll always be on top of my blogging game each week. December 27 I took 10-15 minutes to do my very first Master To Do List Entry. I just wrote down everything from cleaning my makeup brushes to creating content for the next posts that will be published on my blogs. I have a little color coding going on. Blue is for work, Green is for SavingsPinay and Pink is for IzzaGlino. Every now and then I will find a quote which relates much to my theme for the year. Here I wrote it down so I will always remember my mantra. That's it so far on how my Master Notebook/Bullet Journal is set up. It's a very random notebook currently but I hope as time pass by I can fill it up with a lot of lists that matter. Are you also using a bullet journal this year?